CorGal® Tanks are constructed of Scafco corrugated, galvanized, punched and rolled steel wall sheets that are bolted together at a project site. CorGal tanks are adaptable and range from 6’ to 105’ in diameter holding anywhere between 700 and 620,000 gallons of water. CorGal tanks are installed with preliners and flexible membrane liners on the inside of tanks for water containment. To learn more about CorGal steel tanks, click here. Click the link for a comprehensive (printable) list of CorGal's tank capacities and sizes. Water Tank Sales is also trained and experienced in developing wood/timber based water tanks. 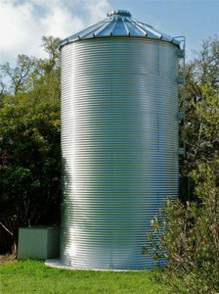 We use TimberTanks™ water tanks. Wooden water tank sizing information can be found here. (For More Pictures/Information Click HERE!